Each Doll comes with 3 boxes to unbox! Collect 4 Mini Doll Surprise Accessories for your favorite Boxy Girl Mini Doll! 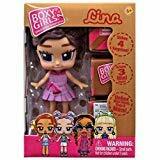 Boxy Girl Tasha Mini Doll 2.5"
Boxy Girl Coco Mini Doll 2.5"
Boxy Girl Ellie Mini Doll 2.5"